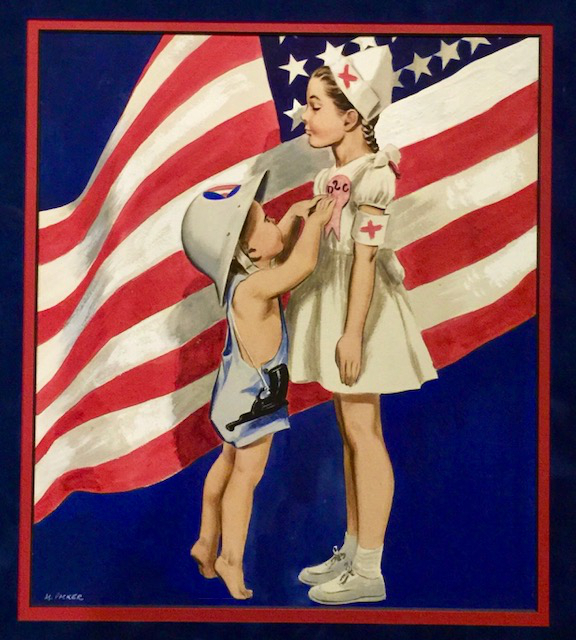 This World War II era gouache on board painting was created by A.S. Packer, and was possibly used as a cover for American Weekly or one of the many other Hearst magazines. This is a great image of two young children, with the little boy affixing a USO Ribbon to his sister's nurse's dress. The nurse and the little boy are modeled by the artist's two children. The little boy is wearing his dad's Civil Defense hat. A. S. Packer was born on September 27, 1901 in Chicago, Illinois. He studied at the Art Institute in Chicago and at the Academies Julian in Paris. He was a lifetime member of The Society of Illustrators, as well as holding the title of President of the New Rochelle Art Association. He spent time with the Air Force Academy, where he was commissioned to do public relations paintings for the war effort. He worked for the top newspapers in Chicago and New York City in the 1920's and 1930's, as well as several advertising agencies. Most notable was the fact that he worked for Hearst Magazines from 1943 thru 1985, when he retired. His artwork appeared on the covers of American Weekly and Parade Magazine. A. S. Packer passed away on October 14, 1999.